The ARK is one of five possible fifth levels of Shadow the Hedgehog. In the game's branching path structure, it follows from taking a highly evil, Robotnik / Black Arms-aligned path through the previous levels. As the Black Comet's invasion of Sonic's world keeps up the pressure, Black Doom sends Shadow along with the Black Arms army to assault an orbital target: the Space Colony ARK. If they can gain control of the Eclipse Cannon inside, victory for the aliens will be all but assured. 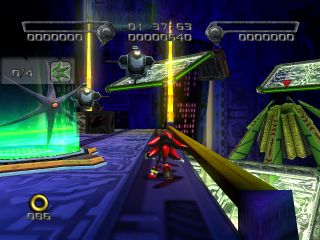 This level takes place along the same route as Sonic Adventure 2's Final Rush, although the grindrails are largely gone; instead, Shadow takes a ride on a flying Black Volt. The name of the game in this level is therefore dodging zero-g rubble while flying in order to maitain the Volt's health, all the while spamming missiles to take out Black Hawks and the ARK's static defences. As is usually the case, the neutral mission is considerably easier, requiring Shadow to merely fly past obstacles at speed and reach the end of the level. Destroying the four ARK defensive machines requires you to jump off the Volt and open fire; all except for the final one, which must be blown to pieces using the Volt's missiles alone. As you approach, slow down as much as possible to avoid accidentally flying past the machine and on to the Goal Ring. The Shadow Rifle helps in this mission as it destroys the defense systems in a few hits. This level can only be accessed by evil means; either by destroying Central City with the five blockbuster bombs or reliving Shadow's massacre of GUN troops half a century ago in The Doom. Whichever method is used, Black Doom seems satisfied enough at Shadow's pure dark leanings to place him in the vanguard of the attack on the Space Colony ARK. Warping both of them into space, Doom orders Shadow to go ahead of the main army and take out the ARK's defensive matrix, thereby ensuring the Black Arms forces will have a clear path to the Eclipse Cannon. The exterior of the ARK is choked with mechanical rubble, presumably shaken off the superstructure during the abortive colony drop at the end of SA2. Making matters even more difficult is G.U.N., who have not been neglecting their orbital defensive strategy; floating military robots and green energy barriers also impede the Arms' progress. Shadow can either follow Doom's orders and clear a path, or bypass the defenses and fly into the space station alone. The Secret Door is located past the 6th checkpoint. It contains 3 extra lives, which can come in quite handy after falling off the Black Volt numerous times.